If I were to be 100% honest, I was first drawn to this book merely for the cover and title alone. 'Sick of Me'? Oh yes, I felt that! As a perfectionist and someone who deals with constant anxiety, I am constantly plagued with ideas of not being enough, and wishing I could be someone different. Perhaps many of you see the title and think the same thing yourself. But let's be very clear, this is NOT a self help book. As she says in the book, " Self help's endgame is my happiness. Sanctification's goal is my holiness." Oh, what a big difference that is. To be honest, there are books right now that are very popular in the Christian women community (even put out by Christian publishers) that definitely fall much more into that self help category. They tell us if we only try harder and put in the work, our lives will be better. Happier. That's not a biblical message in the least. This is saying that WE have the power. 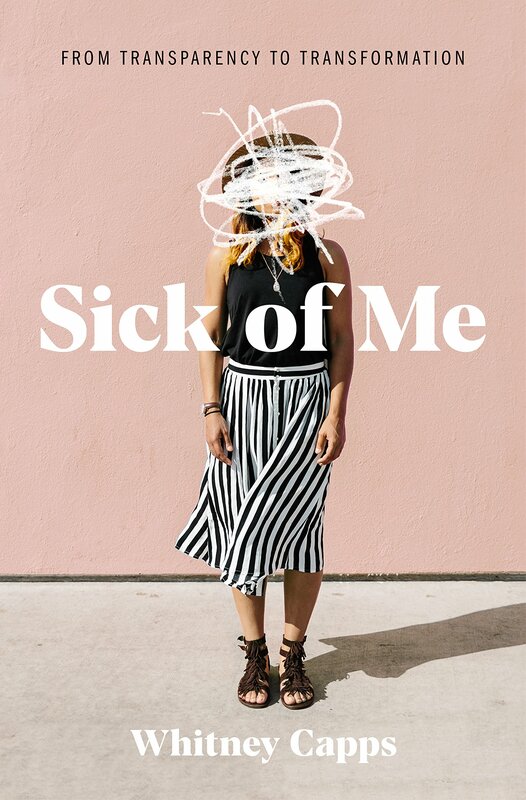 'Sick of Me' shows us MANY biblical examples that instead remind us that GOD has the power to change us... but that we must truly want and be willing to accept that transformation. What a contrast this was... but an important one that I think so many of us women need to hear. But I must say, this was a tough book to read. No, not in that it was intellectually challenging to read. In fact, I finished it in about a day, and found that it was really written in a way that women could relate to and understand. No, it was that understanding that made it tough. It was reaching us right where we are...making us deal with ideas and truths that we might not want to truly deal with. Still, it wasn't written in a way that put us down for those shortcomings. In fact, Whitney shared throughout that these were areas in which she struggled to...and that knowing these truths and actually putting them to action are two very different challenges. I found this refreshing. I think- especially again coming for someone with many insecurities- had it just said what we were doing wrong without also sharing in that personal part of it, it would have been very disheartening. It could have said, 'you're just not good enough'... but it wasn't that at all, and I appreciated that. Overall, it was a really great read and one that I feel most women can truly get a lot out of. 'Sick of Me' is available to purchase at your favorite Christian book retailers.